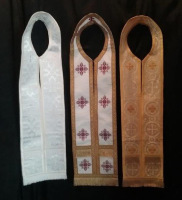 Along with Vestments & Dalmatics, I can also provide Sick Call Stoles and Travel Pouches. Let me know if you want to order one of these sets as they can be customized with any color you choose. 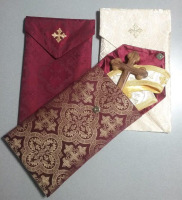 The Sick Call Stoles have a deep pocket in the back to hold a prayer book and prayer cards. The Travel Pouches are created with a heavy base to make them sturdy. 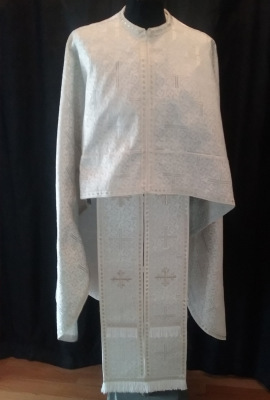 A large pocket will hold your Stole and a separate smaller pocket is divided into three sections to hold your hand cross, holy water, and oil. A strong magnet on the flap keeps it closed. 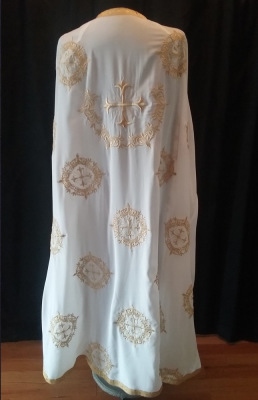 The below items are available for immediate sale. 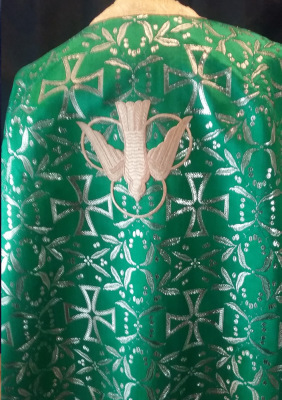 These are finished vestments and the sizes are shown below. 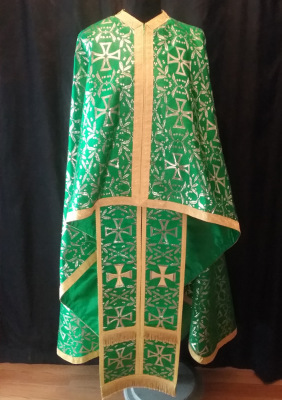 I make a few vestments to show when attending clergy symposiums. 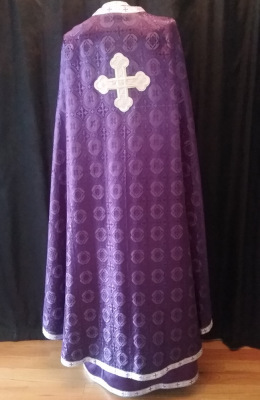 I am now making them available for sale at a reduced cost. 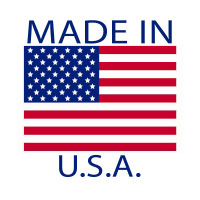 Prices do not include any shipping costs. 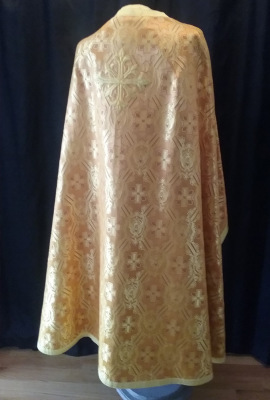 Angelica is a two tone deeper gold rayon fabric and gold lining. 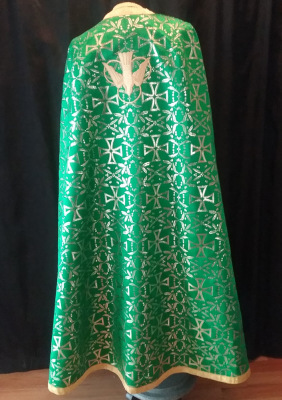 # 535 yellow gold, rayongalloon using an 8” and 6” cross to form emblem. 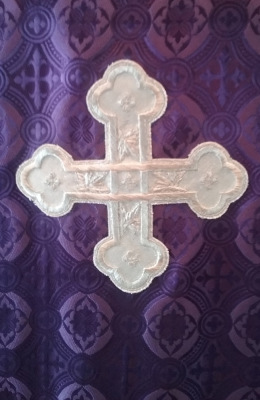 If interested, you can request a fabric swatch. Cuffs measure 7.25” atwrist, 10.75” wider end and 6” deep.” You can request elastic or rings and ties on cuffs. 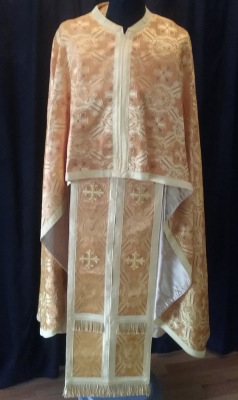 Vestment: Front: 18 - 3/4" Back: 51 - 5/8" Epithrachiel: 47.5"
Cuffs and Zone included. 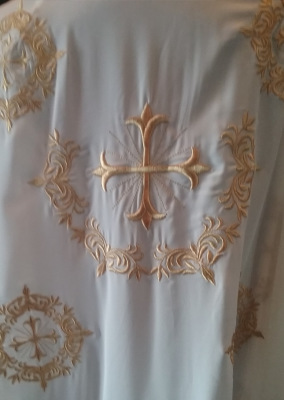 Does not come with a Chalice set. 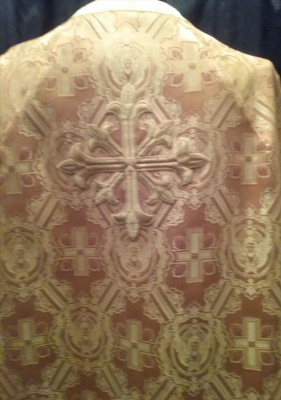 This gold embroidered cross pattern is on a flowing light-weight washable crepe fabric with # 650 gold galloon. You can request elastic or rings and ties for cuffs. 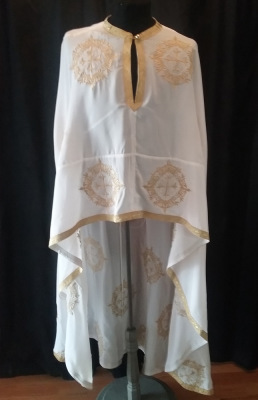 Cuffs, Zone, and Chalice Covers/Aer included. 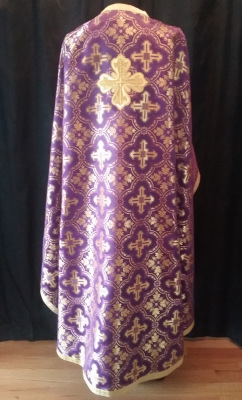 This rich looking purple/gold rayon fabric is lined in gold, with # 650 gold galloon and #226 emblem. You can request elastic or rings and ties for cuffs. If interested, you can request a fabric swatch. Cuff measures 8” atwrist, 10.75” wider end and 6” deep with rings and ties. 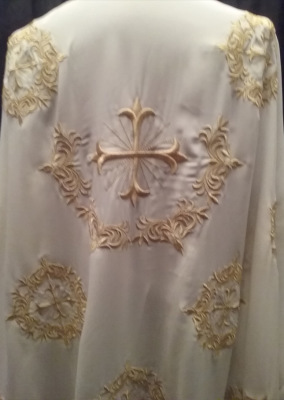 Vestment: Front: 20 - 1/4" Back: 55.5" Epithrachiel: 48.5"
This is real metallic fabricand has plenty of body. 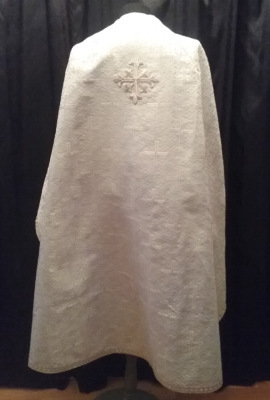 Robe is unlined. 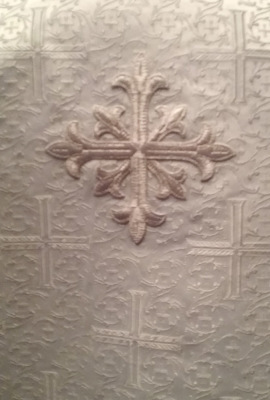 If interested, you can request a fabric swatch. Cuffs measure 7” atwrist, 10” at wider end and 5 – 3/4” deep. You can request elastic or rings and ties on cuffs. 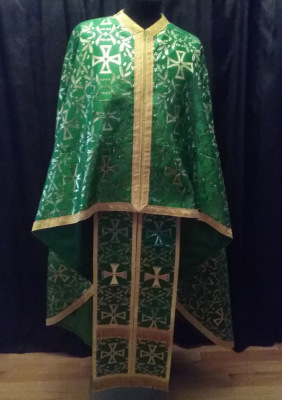 Vestment: Front: 19" Back: 48" Epithrachiel: 45 3/4"
This vestmentis a green/gold is a Lurex metallic/green lining with an above average gold galloon #1687 and W-162 gold emblem. Cuffs measure 8” atwrist, 10.5” at wider end and 6” deep. You can request elastic or rings and ties on cuffs. 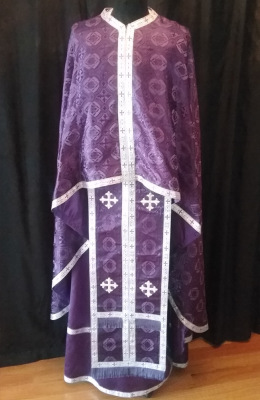 Vestment: Front: 23 - 1/4" Back: 55.5" Epithrachiel: 50"
This is a deep two toned purple rayon fabric with a complimentary silver/purple Diamond/cross metallic galloon. 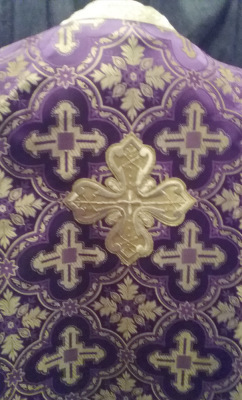 Emblem # 700. 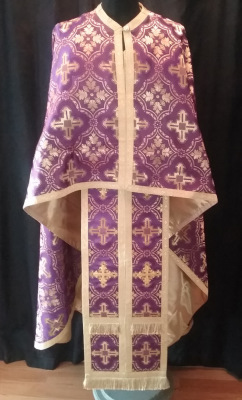 Vestment is lined in purple satin using matching galloon. Cuffs measure 7 – 3/4” atwrist, 11” at wider end and 6 – 1/4” deep. You can request elastic or rings and ties on cuffs. 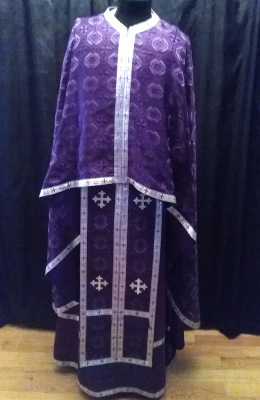 Stichar is the same purple bridal satin as robe lining. 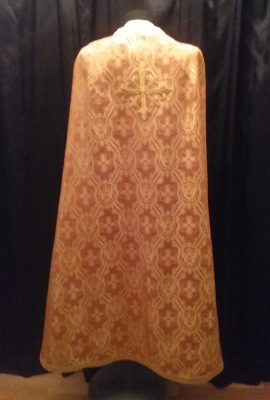 Back length is 62” Original cost $200.00. 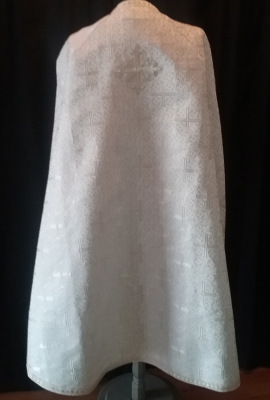 Sale price $100.00. 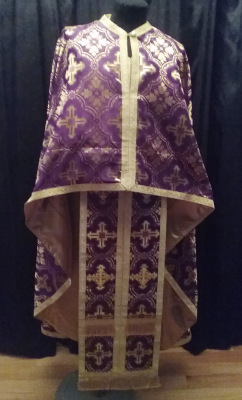 Vestment: Front: 21" Back: 57.5" Epithrachiel: 51"